Prepare the noodles according to packet directions then refresh under cold water. Set aside. To make the dressing, combine all dressing ingredients in a small bowl and whisk together. Pour half over the cooled noodles and mix together with your hands or tongs to evenly coat. Heat a non-stick frypan over high heat, drizzle in a little olive oil then add the prawns and kaffir lime leaves. Cook for about 2 minutes on each side until opaque and curling up. Discard the kaffir lime leaves once the prawns are cooked. 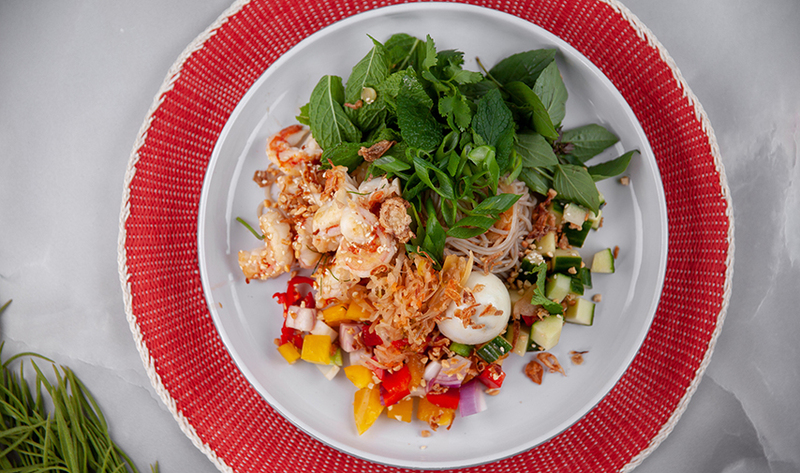 Assemble the salad by placing the noodles, cucumber, capsicum, onion, herbs, kimchi and egg in a serving dish. Scatter the spring onion and chilli on top then top with the cooked prawns. Pour over the remaining dressing and sprinkle over the deep fried shallots, peanuts and sesame seeds, and toss everything together. Serve immediately.